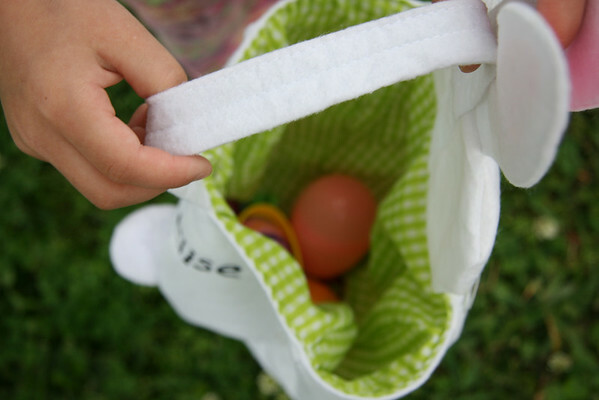 Saturday began with a morning jaunt to our local park for the annual egg hunt. I don't know if it was the fact that Annelise has moved up into a more aggressive age group (the 5-7 year olds), she was too slow or if this was the reflection of harder economic times, but her basket was woefully shallow this year. 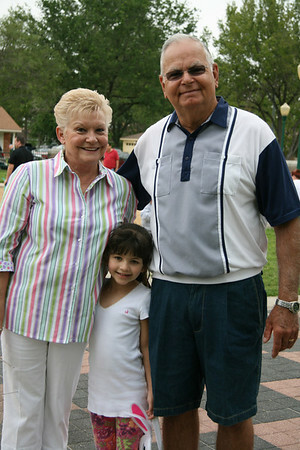 It didn't phase her too badly since there were plenty of friends to visit and play with and Pappo and Grandma too. Saturday was also the day Annelise mastered the monkey bars. She was quite pleased with her upper body strength and agility. Well, I guess that was me, she was just happy she could finally do it. 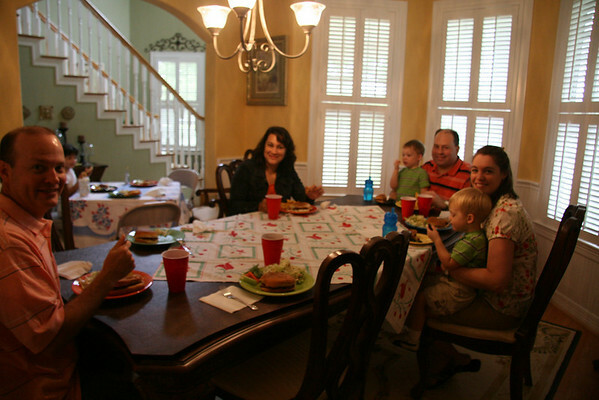 After the egg hunt and playground excitement, we gathered back at our house for lunch. One of my goals this year is too practice more hospitality. Finally in the fourth month of this so called goal, I got around to it. I know. I have a tendency to make big hairy deals out of things and can find myself getting caught up in paralyzing perfectionist paranoia. Do you know what I mean? Is my house clean enough, Is the food good enough? Will every one have a nice time? What if...? blah, blah, BLAH. So, you know...I usually end up not inviting people over like I should. Saturday was different because I was determined not to get caught up in those silly worries. I did not super duper clean my house. Yes, you read that right. Since we have Sadie, the Incredible Hair Shedding dog along with two cats, I did a quick vacuum, and made sure the potties were clean, but that's about it. I planned a super easy lunch of sloppy joes (that warmed in the Crock-Pot while we were out), this yummy Asian Cabbage Salad, chips and drinks . That's it. The morning had been cooler than usual, so instead of eating outside like I had semi-planned, we decided indoor dining would be better. Lickety split I dumped a stack of stuff from the table into a laundry basket, moved another stack to a chair, set up a card table, and pulled two vintage tablecloths from the drawer and we were good to go. We used paper napkins and plastic cups, but real plates, and you know what? It was all okay. The kids took breaks from eating to play and the grown ups had plenty of time to chat. Love that. I was relaxed and really happy to have friends in our home. I don't think I can adequately describe my feelings of joy, mixed with kick myself regret for not doing this more regularly. The afternoon reminded me that the most important thing is friends being together, not being paralyzed into rarely entertaining because of ridiculous doubts and worries. 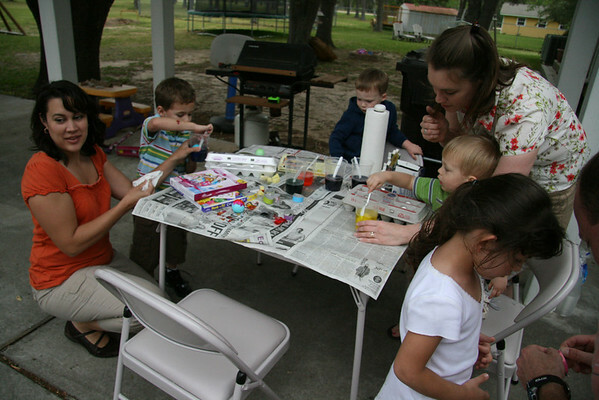 In between outside play time for the little people (and the big), we dyed eggs. Once Annelise made it clear she'd rather play than be creative with food coloring, I briefly questioned my thought pattern in boiling 1.5 dozen eggs the night before. Oh well. 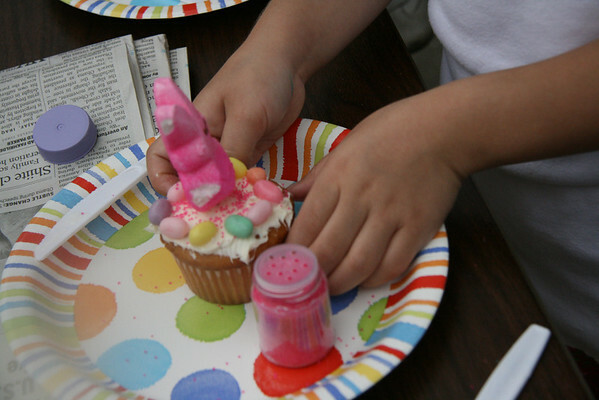 However, she was all about cupcake decorating! 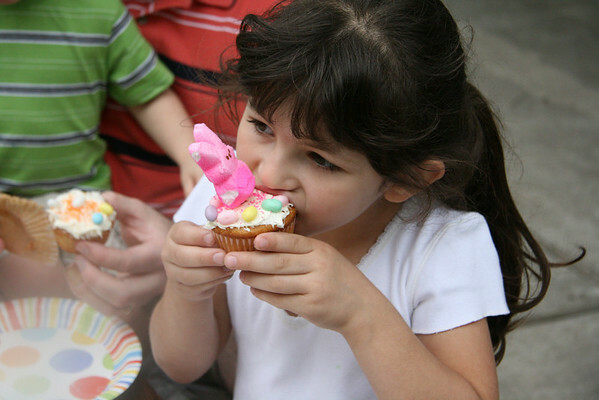 She was aghast when her sweet 2 year old friend, J. went slightly over his Peep quota. She may have also doubted his methods of smooshing instead of toothpicking. Girls vs. boys. Of course her worries did not keep her from enjoying the fruits of her labor. YUM! Later that afternoon Scott, A. and I got a little crafty with the remaining blank eggs. We decorated hot eggs with crayons (idea from Crafty Crow). 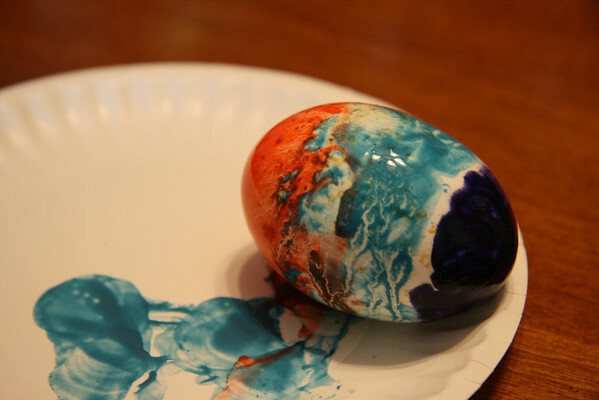 I heated the eggs in the oven (350 degrees for 15 minutes), then used A's peeled crayons to decorate. It was so cool to watch the wax melt against the eggs! 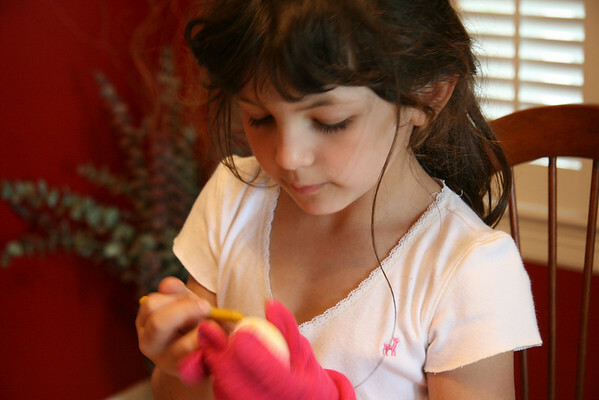 She alternated wearing one of my knit gloves and using a hot pad while she colored. I had fun swirling the melty wax and making cool patterns. 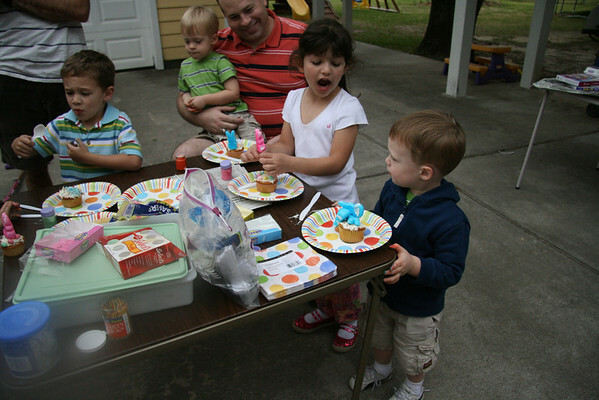 This crafty activity was a hit with the whole family. 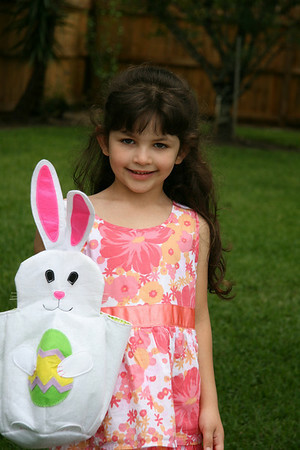 Annelise had so much fun Saturday, she totally forgot about checking her Easter Basket Sunday morning. In the past I've put a lot of thought into her Easter gifts, choosing just the right bunny, her favorite candy, a special book, etc. I've always bought everything well in advance. This year I found myself wandering the aisles at Walgreen's Thursday while she was in dance class. What's up with that? Once she remembered to look for her basket, she was pleased as punch with the smattering of random candy, her own stash of gum and a $1 carton of sidewalk chalk. Note to self: kids are easy to please, even by last minute Walgreen's shopping, so calm down. After church we spent the rest of the day over at my dad and Peggy's house. Of course there was food, food, food, with a side of more food, all of it delicious. Her son's family and her grandchildren were there too (I had not met some of them yet) so that was nice. Two of the grandsons are older (one in college, one a senior in high school), so Annelise was completely in awe of them, whether they were playing basketball outside or watching the final rounds of the Master's golf championship on TV, she was a bit of a stalker. It was so funny to watch her watching them, and actually being kind of shy. There are also two younger grandsons close to Annelise's age, so she LOVED playing with them. Hunting eggs, playing basketball, playing soccer, playing tag, climbing a tree and having a water balloon *fight*were all on the agenda. All in her Easter dress. FUN weekend! She looks SO cute in her dress. I am usually an Easter basket freak, too. Everything hidden in my closet for weeks. But you are right, they don't care. They love it all. I looked forward to your Easter weekend post - looks like you all had a busy and fun time! I too am trying to get over myself in the hospitality department. Now that I'm a pastor's wife (still getting used to saying that...) I feel like I need to stretch and grow in this area to get to know people better in our church. I love your tablecloth in the middle of your table, by the way! And I so adore A's Easter dress, too. 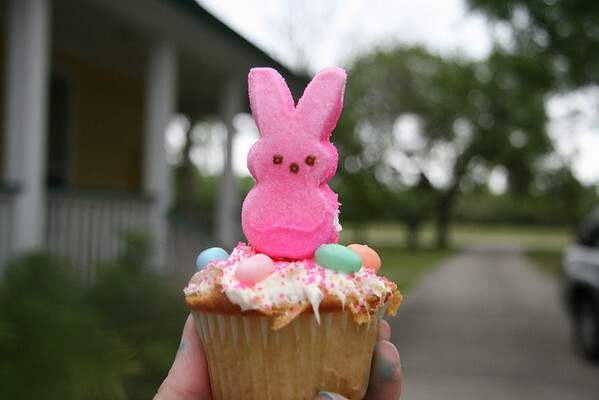 I love the sight of Peeps too. You should check out the Washington Post's Peeps Contest entries. So creative! what a great dress!!! :) and i love the dilemma about peep smooshing or toothpicking! You're such a great mom. She's darling. It looks like you had a great Easter weekend. I did the same thing with my boys' baskets this year. I couldn't justify the cost and was worried about it but they were happy with the water balloons, water guns and bubbles I picked up at Walgreen's on Saturday! We tend to worry so much and they're happy with whatever. Yes...peeps make me smile, too as does your comment about his days being numbered! The egg was really neat! You know I am a detail girl! It does get in the way of things at times such as having people over too! It looks sooo fun! It is so wonderful to see the kids making memories together! Ok, I want to send A. a huge box of eggs! Sweet girl! Her basket made me so sad...we hid 64 eggs for our boys alone- Crazy?...Yes, but their baskets were full and my adorable husband is happy to have the candy! 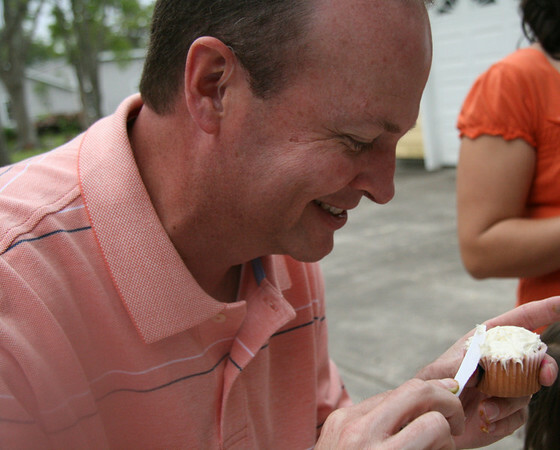 Oh my, what a cupcake!!! !